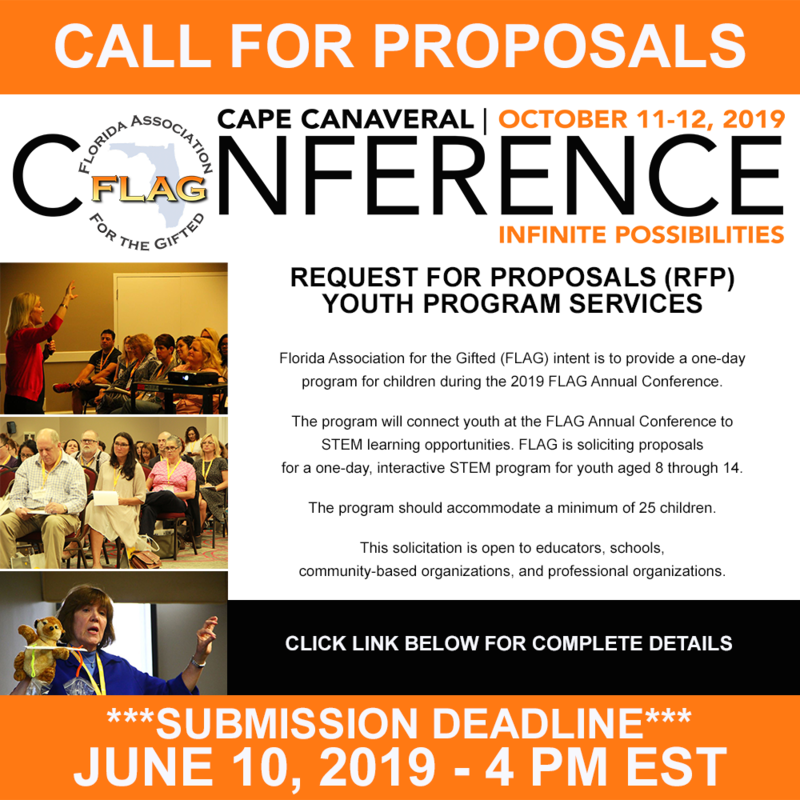 Submit a proposal to present at Florida Association for the Gifted (FLAG) 2019 Annual Conference in Cape Canaveral, October 11-12, 2019. Our Annual Conference offers education leaders and policy makers the connections, tools, learning opportunities, and strategies they need to understand and implement effective gifted learning in their classrooms, schools, and districts. Submit your proposal to present a concurrent session and join teachers, administrators, parents, and guidance in exploring and promoting and support educationally sound programs for gifted learners through awareness, advocacy, and action. The proposal deadline is Monday, June 10, 2019. The theme for the 2019 FLAG Annual Conference is "Infinite Possibilities." 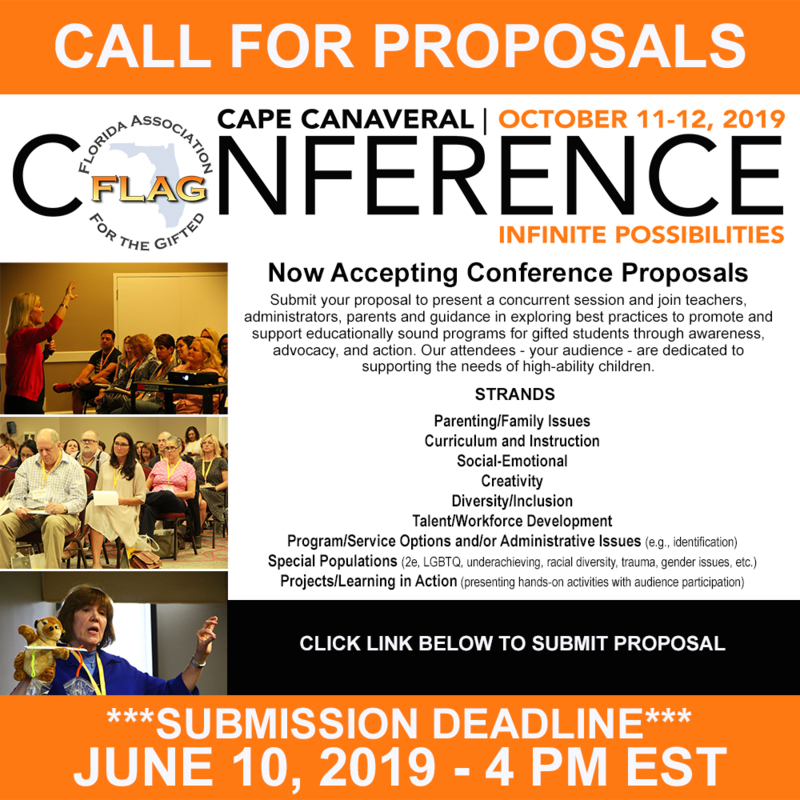 The 2019 FLAG Conference will begin with pre-conference sessions on Friday, October 11 and Saturday, October 12, 2019. A Welcome Reception will be held on Friday, October 11th after the final session. Content Friday and Saturday will include concurrent sessions, as well as a general session, lunch and a keynote address each day. Other session types include thought leader lectures, roundtables, and featured presentations.